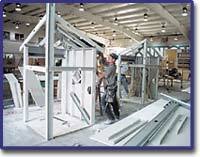 Carpenters work in many different areas of the construction industry. The need for carpenters is greatest in the field of new construction, but many carpenters also work on modifying existing structures or remodeling projects. Carpentry is a year round occupation that requires skill with wood materials, metal framing, flooring, lath and other fabrication techniques. The Joint Brotherhood of Carpenters and Joiners offers a four year apprentice training program to those who wish to enter the carpentry trade. Carpenters use subflooring, sheathing, floor joists, studs and rafters to assemble a building. Carpenters also install heavy timbers, build forms for concrete, erect scaffolding and install floor coverings. Finish work including the installation of molding, wood paneling, cabinets, window sashes, door frames, doors and hardware is all done by carpenters. Carpenters build stairs and lay floors, cut and fit plywood, wallboard and other materials. Carpenters need strong mathematics skills, good mechanical aptitude, physical strength and agility. They work with both hand and power tools and need to be skilled in the use of measuring tools and blueprint reading. The opportunities for journeymen carpenters are as varied as the buildings they help to erect. Millmen produce custom millwork for specialty applications and other architectural details from all types of materials for new and restoration work. Millmen fabricate cabinets, shelving, and wood trim including base molding and crown moldings. Millmen also install cabinet doors and hardware. Millmen produce fixtures and cabinets for permanent commercial installation, such as those used in hospitals, offices, hotels, motels, restaurants and mercantile establishments. Executing the unique interior design details conceived by the architect or other design professional is the main function of wall and ceiling tradesmen. Wall and ceiling craftsmen often erect and finish interior and exterior sides of curtain walls on commercial and institutional buildings. 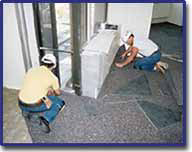 Then, working with a wide variety of commonand sometimes exoticbuilding materials, these craftsmen subdivide the open floor area of a newly erected, unfinished building into offices, work areas, hallways, restaurants, restrooms, lobbies, and any other conceivable interior work or living space. Once the heating, plumbing, electrical and mechanical systems are in place, the ceiling work can be completed. Interior walls are generally constructed of cold-formed steel framing and various types of gypsum board. However, clean areas such as commercial kitchens and health care facilities require more durable wall materials. Some of the new abuse and impact resistant gypsum board or cement board materials fill this need. Veneer plaster over “blueboard” is used in other situations where impact resistant walls are required-, as is metal lath and three-coat plaster. Ceilings in most modern buildings are generally constructed of drywall, plaster or one of the many types of suspended ceiling tile systems. Metal Suspension ceilings are hung from the structural steel above the ceiling. A wide selection of acoustical and light reflecting features is available in an economical suspended ceiling. Accessibility to mechanical, electrical and plumbing systems is one of the benefits of suspended ceiling systems. To properly do the job, wall and ceiling tradesmen need a thorough understanding of the materials, techniques and tools used in their trade. This means having strong mathematical skills; having the ability to properly use both hand and power tools, laser levels, and other sophisticated measuring tools; having the ability to read blueprints and other construction documents. 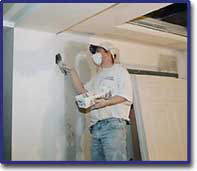 Drywall finishers are important members of the interior finishing team. The drywall finisher ensures that all seams, angles, corner beads and nail spots are finished and sanded smooth. Finish work around critical lighting and architectural designs are areas where unique techniques are used for reducing expansion, crowning, ridging and beveling edges of walls and ceilings. This is necessary in creating a unified and seamless wall or ceiling surface to which paint, wallcoverings or other decorative finishes can be properly applied. The finish work done by drywall tradesmen is accomplished with various hand finishing techniques. 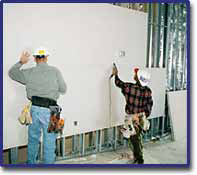 Fire-taping, sanding, screw and nail spotting are a few of the specialized techniques used to finish drywall in the commercial and institutional building environment. Drywall finishers also use joint treatment material to finish metal trim and corner beads. The drywall finisher uses different types of tape and specialized sand-paper designed for both wet and dry sanding. Sanding is done either with a pad, block or a “pole-sander.” Joint treatment compounds are applied with drywall tape to seal the joints between sheets of drywall material. Application of compounds and tape can be done either by hand or “bazooka.” The bazooka is a specialized drywall tool that applies both tape and joint treatment compound in one application. The bazooka saves both time and money and many contractors choose this method over hand application of joint compound and tape. Drywall finisher apprentices are trained in a two-year apprentice program taught at the Painting and Drywall School in Hazel Park, Michigan. Those in the drywall trade must be especially aware of safety due to their frequent use of ladders and scaffolding, as well as often working in confined spaces. The ability to read blueprints, good mathematics aptitude and mastery of the architect’s scale, as well as knowledge of the care and maintenance of the specialized equipment used in the trade, are all part of the skill and artistry of a successful drywall tradesmen. Lathing is a branch of carpenter trade. Lathers work with the metal components of a building's structure including black iron, cold formed steel framing, and metal lath. Lathing is the foundation or metal framework over which wet plaster or Exterior Insulation Ffinishing System (EIFS) materials are often applied. Floors in computer rooms that allow cables to run under removable floor panels, wall partitions and office furniture systems are some of the unique elements the Lathers are responsible for installing. Spray applied fire proofing materials are also occasionally applied over metal lath when the condition of the substrate prevents the direct application of the spray applied fire proofing materials . Lathers are responsible for the constructing and installing of all light iron construction, furring; making and erecting of brackets, clips, and hangers out of wood, wire or metal lath. In addition, the lather is responsible for the nailing, tying and fastening of wire and metallic lath and the placing of hangers that support suspended ceilings. Lathers not only work with wall and ceiling construction, but also work with all types of floor lath. Lathers learn their trade at The Carpenter’s Apprentice School and on the job as apprentices. Lathers need to be skilled in light gauge welding, the use of the builder’s level and transit, roof framing, cold formed steel framing, drywall installation, demountable partitions, advanced math, interior trim installation, stair building and blueprint reading. They must attend the Carpenters Apprentice School for four years before achieving journeyman status. The scope of the plasterer’s work is quite diverse. The wide range of projects a plasterer might work on can range from the intricate coves and soffits in a cathedral to the clean lines and geo-metric details of a shopping mall or school gymnasium. Plasterers typically apply gypsum plaster to some type of lath or an interior masonry substrate, install exterior insulation finish systems (EIFS), apply stucco to exterior walls and ceilings, and install or spray-on soundproofing and fireproofing in buildings. In a typical plaster application, the surface must first be prepared to receive a plaster finish. This often requires the installation of one of several types of metal lath, or gypsum lath or the substrate may be bare masonry. The plasterer then applies plaster, stucco or cement with hawk and trowel or mortar pump over the substrate. The skilled hand of the plasterer may then add intricate and often complex design details to a surface that imparts a hand crafted quality to a project. Skills such as wall and ceiling layout and blueprint reading help the master plaster tradesmen translate the deign details in blueprints and shop drawings into permanent works of art for generations to come. Plaster is used widely in restorations, and many new construction projects integrate plaster with newer technologies. Plasterers create specialized molds used to cast detailed decorative designs or moldings that are then applied to a ceiling or wall surfaces adding stylized design elements to the interior surfaces of the structure. These castings, along with new wet-applied moldings, are used in the restoration of theatres, churches and older buildings to return them to their original opulence. 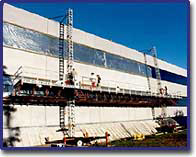 EIFS is one of the most widely used new materials applied by plasterers. Used in both new construction and renovation, EIFS is a system that incorporates rigid expanded polystyrene insulation with specially formulated basecoats, fiberglas mesh reinforcement and acrylic finishes, to provide a wall system, which is both thermally efficient and aesthetically appealing. The wide variety of colors and textures, skillfully applied by trained, experienced tradesmen, offers design flexibility, which is unsurpassed in the in the industry today. The installation of carpeting, hardwood flooring and resilient flooring made of linoleum, vinyl composition tile, solid vinyl tile, conductive tile, vinyl and rubber sheet products is the specialized work of the floorlayer. Using the skills learned at the Carpenter apprentice school, floorlayers scribe, cut, fit, layout and install the many types of flooring materials according to the specifications of the design professional. Installing a floor may include installing various kinds of underlayment to ensure a smooth and level surface for the finished floor. Installing flooring also requires matching intricate patterns and designs at the floor covering’s seams. Flooring tradesmen need to know how to heat weld a floor seam, they need to know how to match carpeting patterns as well as how to create specialized patterns and inset logos and designs. 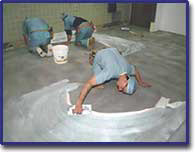 Special floor installation processes are used in areas such as hospital operating rooms or clean rooms. Sheet vinyl must be “flash-coved” up a portion of the wall using heat-welded seams to create a monolithic seamless homogeneous floor that can be flooded for cleaning. Using flash coving, the floor curves into the wall and eliminates the difficult to clean angle at the standard wall and floor junction. Flash coving is just one of several special applications that requires much skill and practice from the floorlayer. The resilient floor trades often have an aggressive building schedule. All other structures in the construction of a project including walls, ceilings, partitions and fixtures must be completed before the floor layers can begin their work. Floor layers perform many intricate tasks under challenging deadlines. The resilient floor tradesmen are often the last group of tradesmen in a building before it is turned over to the owner for occupancy. Flooring contributes to a major portion of the image and mood created when entering a building and serves to be a unifying element in the overall design of a building’s interior. Consequently, the flooring trade involves many precision jobs that must be done with care and attention to detail. Apprentices complete a four-year program that includes blueprint reading, carpet, tile and resilient material skills. 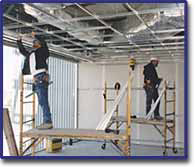 Wall and Ceiling Laborers are a vital link in the construction process. Laborers work closely with carpenters, drywall installers, plasterers and others in the wall and ceiling trades. 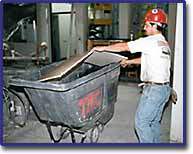 Wall and ceiling laborers may be plaster tenders, material handlers, mortar mixers or trainees. Laborers are not only responsible for materials handling but for properly and accurately mixing plaster, drywall compounds, spray-applied fireproofing, and other materials. Damage control and safety are primary concerns of the material handlers on the construction site. They need to know how to move material from the drop off site through buildings that are undergoing renovations or under construction. 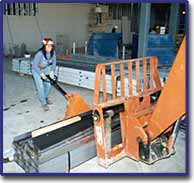 Material handlers have many logistical challenges in occupied buildings. They must consider the safety of those continuing to do business and convey materials with out damaging existing structures. Laborers also assemble, move and remove scaffolding from the work site. As walls and ceilings are being constructed, excess material and debris must be removed from the site to promote safety and provide a clean work area. Knowledge of materials, site safety management, proper material mixing and scaffolding building according to MIOHSA standards are taught in an apprentice program at the Plasterers’ school. Wall and ceiling laborers may upgrade their laborer skills by acquiring further training in material handling equipment or they may chose to enhance their skills by attending one of the apprentice schools for carpentry, plaster, or drywall training. The Carpentry School, established in 1941 is an apprentice training program run in cooperation with labor and management. The carpentry school is funded by the contractors that sponsor and employ carpenter apprentices during their four-year stay at the school. Apprentices pay a nominal fee for tuition. A mandatory 8,000 hours of on the job training hours are required for completion. The school is certified by the Bureau of Apprentice Training and the apprentices receive certificates from both B.A.T. and the United Brotherhood of Carpenters and Joiners of America. All instructors at the school have worked in the field for at least 10 years and have completed the four-year program offered by the school. A high school diploma or GED is required prior to completion of this apprenticeship training program. Carpenter apprentices are required to attend classes at the Detroit Carpentry Apprenticeship school every two weeks. Subjects taught include carpentry mathematics, roof framing, measuring tools, power equipment and blueprint reading. Carpenter apprentices learn to construct partitions, install interior trim, build stairs and install ceilings and metal framing. Guest speakers from MIOSHA, CPR instructors, labor and management help prepare apprentices for work on the job site. General carpentry skills are taught and apprentices may choose to specialize in such areas as floor laying, millwork, lathing and commercial or residential interior systems. While in this program, apprentices are indentured to the school and the joint apprenticeship committee. Apprentices earn a percentage of the journeyman scale wage while they learn. The availability of work determines whether an apprentice will stay with the same contractor through all four years. Applications are taken at the school offices located in Ferndale every Wednesday. Apprentices are matched up with contractors by the school, but an individual contractor may bring a student into the program as well. Prior to admittance to the program each apprentice is given a series of assessment tests in reading and mathematics. Additionally, applicants must pass a mandatory drug-testing. The apprenticeship school, through its standards and practices, ensures that all journeymen carpenters receive a standardized education that meets the requirements of the school and the union. This aids the industry as a whole, by maintaining consistency and high quality workmanship. The school also provides continuing education classes for journeymen carpenters in safety, CPR and supplementary training on new products and techniques used in the field. Each year a statewide competition is held and the winner is awarded the honor of the “Best Carpenter in Michigan.” The categories of the competition are metal framing and interior systems, wood framing, floor laying and millwright work. The competition consists of a four-hour written test and an eight-hour hands-on project. Winners and participants reflect the pride these trades-men take in their industry. The Carpenter school provides an opportunity for high school students to try their hand at the trade and get a head start in an apprenticeship program while still in high school. High school juniors and seniors may participate in a school-to-work program during summer vacation. After graduation from high school this school-to-work program credits 6 months of the apprentice program. Career options for carpenters do not stop at the journeyman level. A journeyman carpenter may consider advancement to a career in construction management. This could mean a position as a foreman, site supervisor or ownership of his or her own construction company. Drywall finishing apprentices learn such techniques as fire-taping, sanding, and screw and nail spotting, applications of joint treatment materials with hand tools, including the hawk and trowel as well as the pan and knife. Finishing with tools, such as the bazooka and the banjo, and the use of box and corner tools are an integral part of their training. All phases of drywall finishing, wet and dry sanding, and proper use of special compounds are covered. Blueprint reading and mastery of the architect’s scale, along with mathematics needed for the ordering of materials and meeting building scheduling requirements, are included in the drywall finishing apprentice’s training. The care and maintenance of automatic taping tools and power actuated tools, safety and good work practices are strongly stressed. Scaffolding and ladder training is also a part of the safety training of the drywall finishing apprentice. A safety course developed especially for tapers includes CPR instruction and first aid on the job. Drywall finishing apprentices learn on the job under the watchful eye of the journeymen drywall tradesmen and attend classes at the Drywall Finishers’ School twice a month. Upon satisfactory completion of 4,000 hours or 2 years of training at the drywall finishers’ apprenticeship school in Hazel Park, apprentices are awarded a journeymen status in the Drywall Finishing Trade. Apprentices learn on the job and attend a three-year apprenticeship at the Plasterer Apprentice School at the Michigan Labor Training Center in Wayne, Michigan. Apprentices are required to pass a general aptitude test, participate in an oral interview and pass a drug test to be accepted. While at the school apprentices learn to develop good mechanical abilities while mastering the handling, mixing and skilled application of such materials as plaster and cement finishes. Apprentices also learn such specialized skills as the design and fabrication of decorative molds used for casting stylized design details. Safety is also highly emphasized in specialized equipment and scaffolding safety procedures.